This essay originally appeared in issue two of Premier Pli, a journal published by First Fold in 2012 and themed on nostalgia. With First Fold on hold at the moment there’s no place to buy Premier Pli that I can find so I’m sharing this here. If you do see a copy though, I recommend buying it for all the other articles in it too (plus a CD of audio as well). 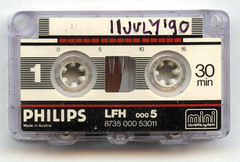 How old do you have to be in order to feel nostalgic? Are we always looking backwards? When I scour my mind for the early memories of my life, I have very little in the way of “memories of time passing”, and I have no idea if I ever experienced nostalgia as an infant. But at some point I started to become aware of the notion of “the past”, and started to experience triggers that placed me back somewhere else in my history. There is an irony of course in that by the time you are old enough to understand what remembering means, you are already too old to accurately remember what it was like to be an infant – by the time we can understand what our earliest memories are, they are already faded and hazy and cracked (if they are not already buried as the result of trauma). Nevertheless, at some point we start to look back somewhere in our lives and start to think about “the past”. Nostalgia dominates this type of experience – but why? We often think of the past with words with a heavy, backward-looking bias; remembrance, regret, melancholy. If our nostalgic memories are fond, it is because an age of innocence has passed and they are that much sweeter by not being accessible now. Is this only something we have learned? From birth and through childhood the emphasis in life is on learning – learning to walk, learning to communicate, learning to grow – time is pulling us forwards and we grow without even thinking. But we are also being taught how to make sense of what we experience. At some point in this flood of new experience we learn the idea of the past, just as we learn the idea of the future, whether it’s something we discover ourselves or something demonstrated. Thinking back to the early memories that I have after I started school I have clear recollections of activities, or places, or sounds, but also memories of what I used to call “magic times” when I was younger – not just an image in my mind or a scented reminder, but something bigger and more all-encompassing, enveloping all the senses and shutting out normal life for an eye blink or two. I see these now as my early experiences of nostalgia, and although they seem quite faded and hard to reach I have sought them out in recent years as, proportional to my own aging, I think more and more about the nature and structure of nostalgia, and whether it really has to be locked in the past after all. I have lists of triggers and clusters of memories and associations in my diaries and notebooks, but one experience stands out above the rest in offering an insight into how I might experience the past. 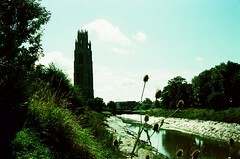 In 1992 I moved from my hometown of Boston, Lincolnshire, to Oxford where my parents were retiring. The two places were very different and it was not easy to adjust to life in a new town. I embarked on a series of bike rides in order to familiarise myself with the city and was struck when riding along one particular road, about 4 miles from the house, by how it really reminded me of a street in my hometown. Not just a street in fact, but a particular time of day and a season of the year too. It was peculiar, because although there was a similarity in the style of buildings, they weren’t unique to that one road in Oxford, and the place I was thinking of back in Boston was not in any way sentimental. But it was clear that there was a definite “vibe” of my hometown in the street in Oxford, and at the time I felt cheered by this – it was an emotional handhold, if you like, a place I could use to link my old town with the new town at a time when I wasn’t really bonding with Oxford. It seemed like “useful nostalgia”. Fast forward to 2001 and I had long since bonded with Oxford and was on holiday, walking along a beach one afternoon in Alcúdia, Majorca. The sea was on one side of the sand and rows of hotels were on the other, stretching their presence out from their grounds and onto the beach with branded sun loungers and cafes and so on. At one point the path curved around to the left and I was faced with the view of the grounds of a hotel. Glancing in I had a sudden, strong sense of the street in Oxford which reminded me of “back home”. It was more than a memory – it was a definite feeling, far greater than I could explain in terms of stimuli or triggers, and quite baffling. Why, in a place that was miles from home and ordinary life, was I struck by such a strong sense of somewhere else? My memory of my hometown had come back via my new home in a far-away and totally unrelated country. Not only another country, but another time – spanning in this instance almost twenty years. Throughout life there are many moments of memory that are rekindled with strong triggers, moments that range from Proustian involuntary memories to Pavlovian behavioural reactions, from fond recollections to trauma and even things we have buried or lost in our minds but have evidence for in the real world. But the Majorcan experience was a sensation of “somewhere” coming out of “nowhere”; it didn’t quite fit what I thought nostalgia ought to be, even though in harking back to a time “when I was once”, it had the persuasive grip of nostalgia. I came back to this multi-level experience time and time again in the coming weeks, months and years, trying to make sense of nostalgia and the past, what triggers these things and…well, why we even have a sense of nostalgia at all. I noticed how my own nostalgia could be quite selective and would shift in favour regularly – the importance of places and times drifted with the different passages of my contemporary life. I would start a new job, and in concentrating my mind on the new life-challenge it posed, would be invaded by nostalgia from different parts of the past. Someone new would come into my life and a whole different seam would reveal itself. 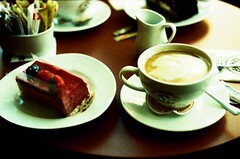 I would start to like a new style of music or a new band, and find different parts of my past life emerging in sympathy. As I thought more and more about the experience of the “third place” in Majorca it instilled something quite profound in me. A notion that at each moment maybe I wasn’t experiencing a recollection of the original street in Boston, or the parallel street in Oxford, or that I was even being nostalgic. Maybe instead at each of these moments I was in an immediacy that had not only taken place in these times before but might happen many more times in the future. I began to grapple with the notion that all three places might be some sort of marker for a particular set of emotions…so far. I became aware for the first time that maybe what I had perceived to be a nostalgic moment may not have been retrospective – instead it might even have been prospective, that I might in time find further places on the planet where the same emotional viewpoint might appear. This would of course divorce the time from the place and the place from the time, leaving…well, leaving what? I guess I was left being in sympathy with my own past. I decided that I wanted to model my own experience of nostalgia, if nothing else for my own understanding of what I thought I was experiencing. In a similar way to conceiving of the structure of a molecule in chemistry in terms of sticks and balls, I considered that my own experience of time might be spiral shaped. The spiral starts and begins at conception and has already undergone several revolutions by the time we develop our own self awareness. 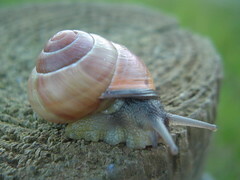 The spiral is a pathway, a marker and a container for all of our experiences throughout our lifespan – think of a snail’s shell, coiling outwards as soon as the snail is born and secreted layer-by-layer by the snail to protect itself from the environment. 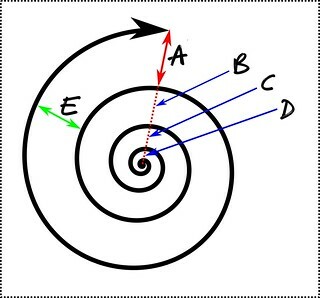 During our lifespan we can consider “now” to be the point where a straight line drawn from the centre of the spiral joins the leading outer edge (point A in the diagram below) to the nearest inner revolution (point B). “Then” is everything on the spiral leading up to this point. Think again of the snail and the ridges along its shell, each ridge being a marker of growth by the snail on its path to maturity. Following our straight line from the centre of the spiral to the edge we can see that it crosses each revolution in different places along its length. If we consider “now” to be point A we can identify these places (B, C and D) as separate instances of “then”, and can see that they are relative to “now”. Note also the value E that increases as the spiral gets longer over time. If we were standing at “now” and looking back to the centre of the spiral (and the start of our existence) we would be able to see these different instances of “then”, stored over there, “back in time”. It is these points which we could consider to be moments when we are in sympathy with our own past. If we can imagine I was in Majorca at point A, then I may well have been in Oxford at point B, and in Boston at point C and experiencing them all in some way. I like to think of each moment as analogous to the harmonic component of a complex sound like a guitar chord or a ringing bell. Life is the complex sound, ringing with complicated harmonics which come together in one moment. As “now” moves forward of course so does our line, and our nostalgia drifts to new points on the spiral. Can this really be possible? I don’t know for sure, but I like to think of things this way at the moment. Like a molecular model, the spiral provides some way of imagining the structure of something that is difficult to see. Each of these points on the spiral might resonate sympathetically like the harmonics of a guitar string. Each revolution of the spiral might print-through to the next like the waveforms on a spirally-wound reel of tape. Or…they might not. It works for me right now – it works because it makes sense of the force behind nostalgia and it encourages me that the pleasurable emotions associated with nostalgia need not be locked away in a time and place of the past. The past need not be a foreign country; it may be just as accessible in some future point in time when circumstances allow us to experience past moments once more in sympathy. Indeed, nostalgia may not be just a journey into the past, but a runway into the future where we accelerate for the ongoing journey through life. Man.